Shop a wide range of duvet protection all which is guaranteed to provide excellent protection for your duvet against incontinence accidents. All are waterproof and easily cleaned providing an efficient and cost effective solution. 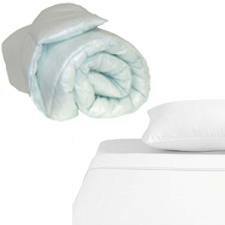 The duvet protection is soft, comfortable and undetectable as an incontinence product. You may also wish to consider other bed protection ranges, which include mattress and pillow protection products for a complete solution.